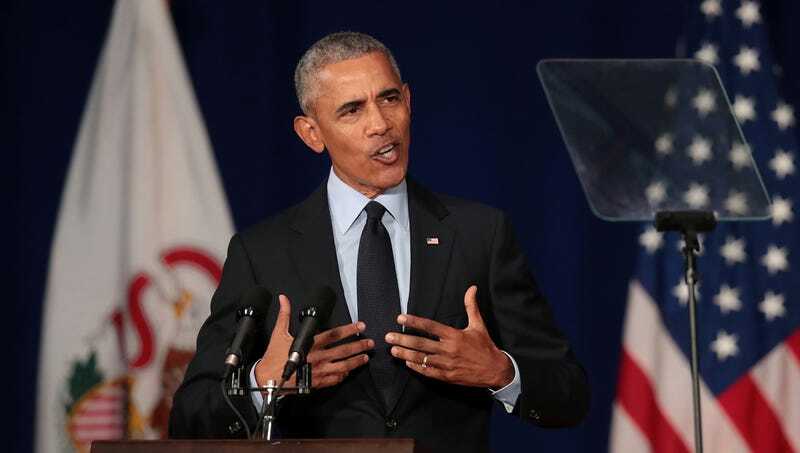 ANAHEIM, CA—In a fiery speech delivered to students at the Anaheim Convention Center over the weekend, former President Barack Obama reportedly urged young voters to get out there and ignore how many lousy candidates the Democratic Party runs. “We’re experiencing a crisis in our democracy that can only be stopped by showing up to vote for people who will fight for transformative change, but until we start offering that, please just go to your polling place and cast your vote for whichever mediocre Democrat is on the ballot,” said Obama, pressing young people to avoid thinking about the actual track records and ideological beliefs of Democratic Party politicians who have been in government for years and just concentrating on the (D) next to their name. “We have too many eligible voters who are staying home on Election Day instead of standing up to the Republican Party by voting for Democrats who are in many respects exactly like their Republican opponents. Less than one in five young Americans voted in the 2014 midterms because our party ran very few good candidates, and we implore you to go out and vote this time even though we’re doing that again. What’s important for the future of America is that you just close your eyes, don’t think about it too hard, and select that name.” At press time, Obama urged the young generation of voters to stand up and save the U.S. democracy, since his generation of Democratic politicians was not capable of such a feat.